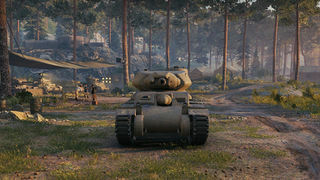 Der AC 4 Experimental ist ein britischer premium mittlerer Panzer der Stufe 6. 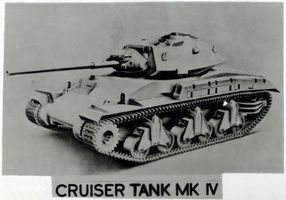 The AC 4 Experimental shares a lot of features with its smaller sibling, the AC 1 Sentinel, and its tier-peer, the Sherman Firefly. It takes on the compact size, fast traverses, and good top speed of the AC 1, but also takes on its somewhat lackluster armor, poor terrain resistances, and painfully weedy engine. From the Sherman Firefly, it brings a quick-firing 17-pounder, which offers high penetration and lightning-fast aim times, but mediocre alpha damage and low shell speed makes it hard to act as a sniper. Taken all together, the AC 4 Experimental serves best as a support tank. 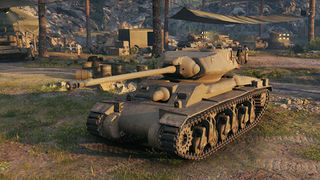 It lacks the armor to brawl and does not have the exceptional power-to-weight ratio needed by flankers such as the Cromwell, but its relatively small size, excellent traverses, and spectacular gun depression make it an ideal second-line fire-support machine. Go hull down, peek over the tops of hills to find targets, and take a shot with the confidence that you can penetrate almost anything you encounter before slipping back down into cover. 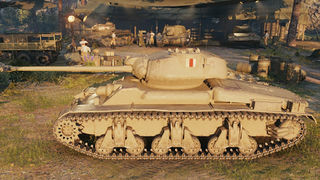 This tank features almost an excessive penetration value of 239mm on its premium APCR rounds, which gives the tank penetration capabilities more commonly seen on tier VIII mediums. If you can pick up enough speed to execute a flanking manuever, you can take apart foes with ease thanks to the penetration and DPM of the 17-pounder gun. This tank is also good for cleaning up weak or injured enemies towards the end of a match, thanks again to its speed and ever-reliable gun. One unexpected feature of the tank is its decent concealment rating, superior to every other medium tank at Tier VI, and even several Tier VI tank destroyers and light tanks. Use these good concealment values to blend in behind bushes, especially those on hills--when combined with its good gun depression, it's entirely possible to fire on enemies unseen and back off to escape detection. The AC 4 Experimental is elite in its stock configuration. Diese Seite wurde zuletzt am 25. Oktober 2016 um 14:08 Uhr geändert.